But despite all the miraculous signs Jesus had done, most of the people still did not believe in him. This is exactly what Isaiah the prophet had predicted: "Lord, who has believed our message? 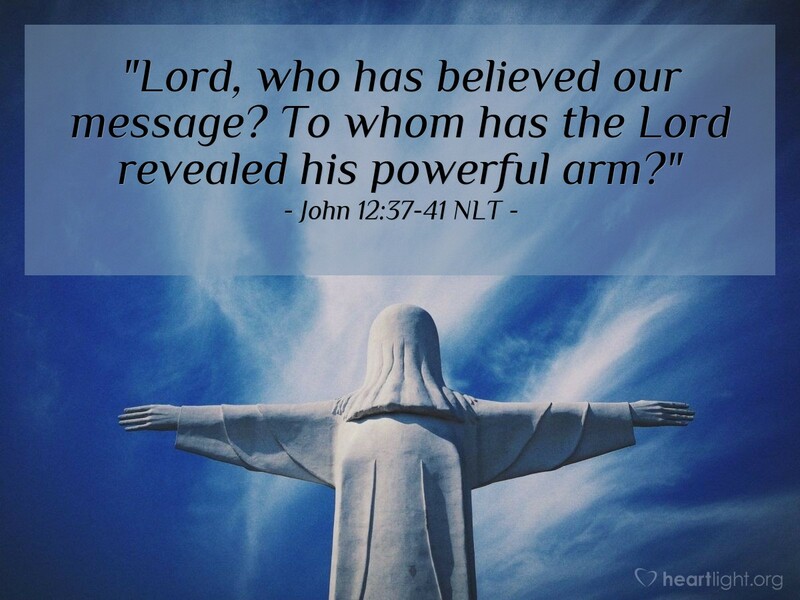 To whom has the Lord revealed his powerful arm?" But the people couldn't believe, for as Isaiah also said, "The Lord has blinded their eyes and hardened their hearts — so that their eyes cannot see, and their hearts cannot understand, and they cannot turn to me and have me heal them." Isaiah was referring to Jesus when he said this, because he saw the future and spoke of the Messiah's glory. Wow! This is a tough Scripture. These people didn't believe because they couldn't believe. Of course, this statement needs to be put together with other passages in John where we learn that they wouldn't believe and that if people would genuinely seek God, they could come to believe. What is the point? Some people, even some religious people, can't and won't believe God's truth even when it is spoken and shown. One reason is that their hearts are hardened to the truth. When we are sharing Christ with others, some just won't believe. We may never be quite sure why they don't, but God knows. Let's always ask the Father to open the door to their hearts through circumstances in their lives that will make them ready to receive God's message in Jesus. O gracious and sovereign God, I do not understand all the ways you work in the lives and upon the hearts of your human children. So I pray for those I know who are not near to you. I pray for those who have rejected you. Please work in their lives to give your people a chance to share your grace with them. In Jesus' name. Amen.